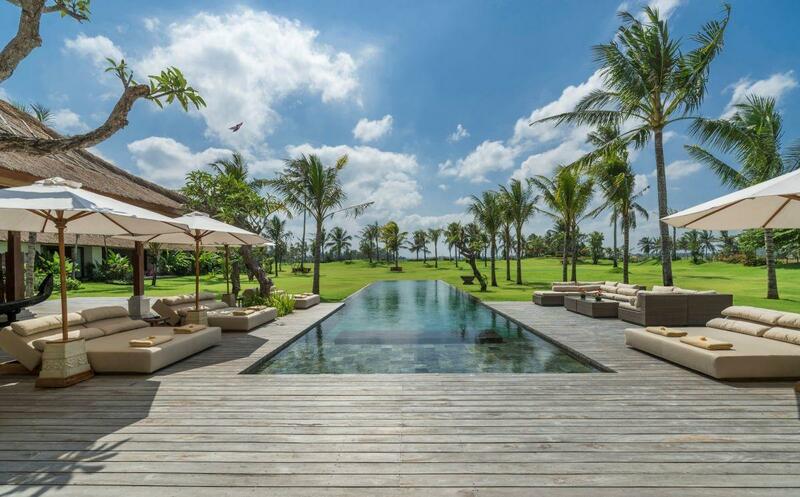 Resting upon a headland beside a deserted beach on Bali's west coast, with a breathtaking 360-degree view of mountains, ricefields and the Indian Ocean, is a spectacular six-bedroom hideaway known as Villa 3555, an exclusive beachfront villa in Bali. Getting to Villa 3555 incorporates a delightful journey through traditional villages, via quiet country roads, wooded valleys, causeways across rivers and, finally, a simple track that winds through the swaying fields of rice. 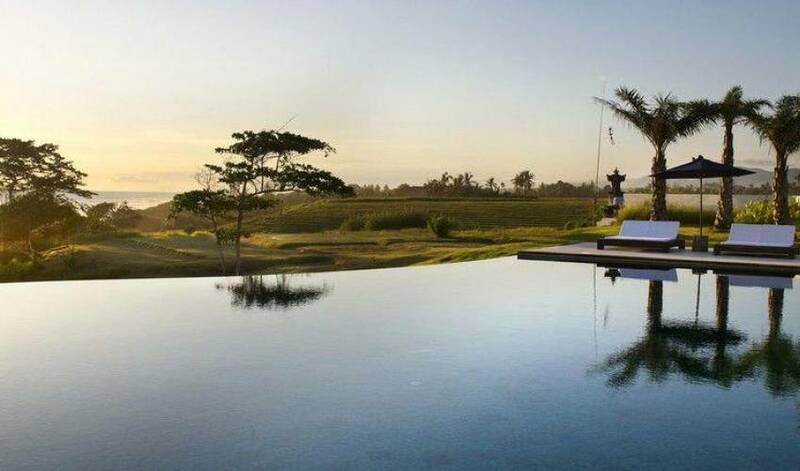 The awesome vista takes in Bali's chain of volcanoes from the mighty Mt Agung in the east, to Mt Pohen, Mt Sangkiang and Mt Batukau - the island's second highest volcano - which rises from its foothills just 20 kilometres away, and majestically stands guard over Villa 3555. 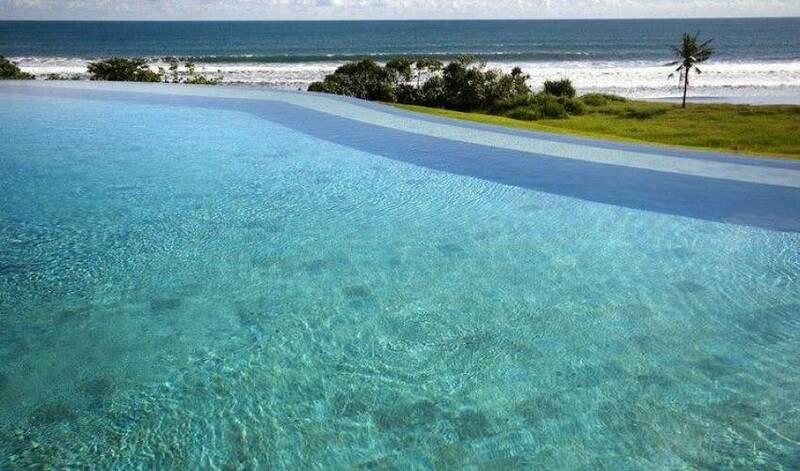 On the seaward side is a windswept beach of glistening black sand, and a coastal panorama that extends all the way down to Uluwatu on Bali's southwestern tip. On a clear day you can see Java; to the east you can watch the sunrise behind Mt Agung and, to the west, the sunsets are amazing. It is simply furnished with large and comfortable cream sofas, ottomans, and a pair of carved coffee tables from Timor, together with a primitive Timorese wooden statue. A floating Yogya stone staircase leads to the upper floor, and a colourful framed patchwork of painted wood brings a splash of colour to the wall. This tropical room is open on two sides - on the seaward side is the garden, swimming pool and the ocean, while on the inland side is an ornamental pond presided over by a ‘floating' 2.5-metre-high Buddha statue. Beyond the statue is an infinite vista of ricefields, unbroken by borders and fences, stretching as far as the eye can see. In another direction, a line of palm tress and jungle follows the path of a river. Open plan and adjacent to the dining room, Villa 3555's immaculate, designer kitchen reveals a discriminating taste for functional beauty and cutting-edge style. It is fully equipped with an imported oven and five-burner hob, a double-door refrigerator, a built-in wine cellar and wine fridge, a cappuccino/espresso machine, a microwave, and everything else that the chef needs in order to prepare delicious meals in accordance with your whims. This bright and airy kitchen is further enhanced by a sliding glass door at the far end overlooking the ricefields. A wet kitchen is tucked away out of sight at the back, linked by a hatch. Toraja The Toraja guestroom is located on the upper floor overlooking the ocean. Accessed via sliding glass doors, it features a soaring roof and is furnished with a kingsize bed, oriented towards the sea. There is also a pair of funky stone pebble lamps, artefacts from Toraja in Sulawesi, and a dressing area and hanging space behind the bed.The adjoining sunny, open-air bathroom is bordered by Yogya stone walls for privacy, yet still offers views of the ricefields and mountains. It is fitted with a bathtub for two in a cream terrazzo surround, twin washbasins, a large wall mirror and a toilet, all sheltered from the elements by an overhanging roof. There is also a raindrop shower open to the sky, complete with a handheld shower, a black pebble floor with stepping stones, and a fringe of yellow irises. 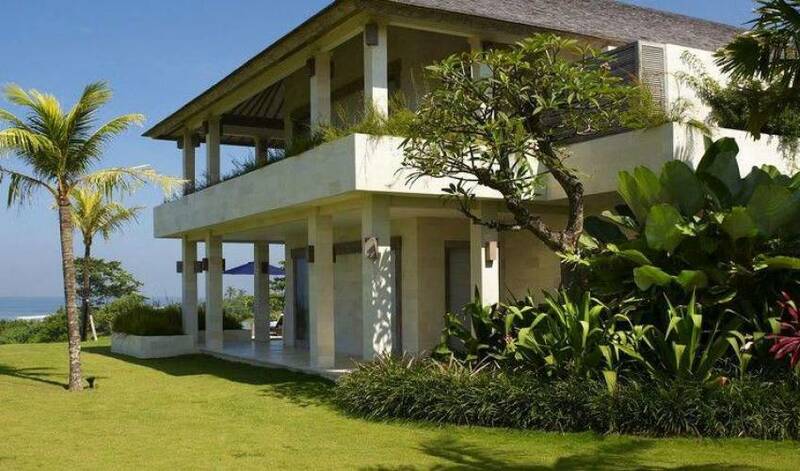 Villa 3555 is located on Bali's west coast, in the Tabanan Regency. This is a coastline famous for its surf beaches, including Medewi and Balian, which offer the longest point breaks in Bali. 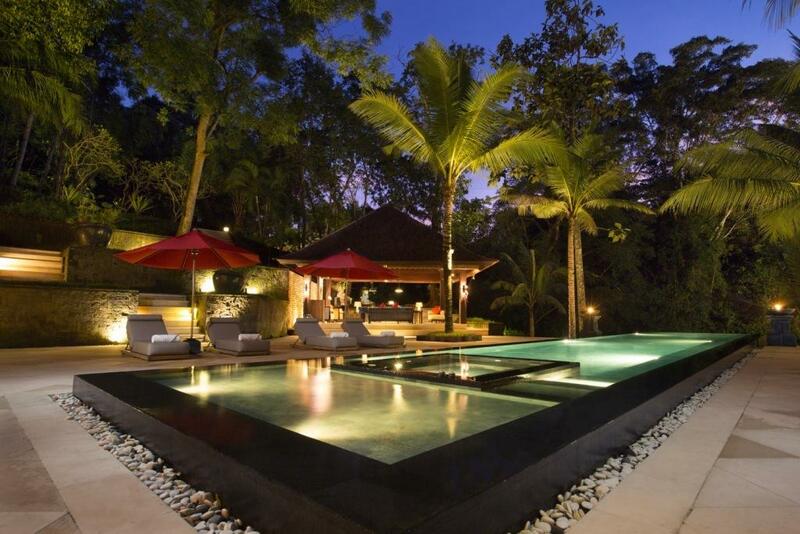 Depending on the traffic, the villa is 90 minutes' drive from Bali's international airport and less than one hour's drive from trendy Seminyak with its exciting nightlife and abundance of fashion boutiques, luxurious spas, and internationally acclaimed restaurants - including the famous ‘Ku De Ta', ‘Kafe Warisan', ‘Living Room', ‘Sarong' and ‘La Lucciola'. 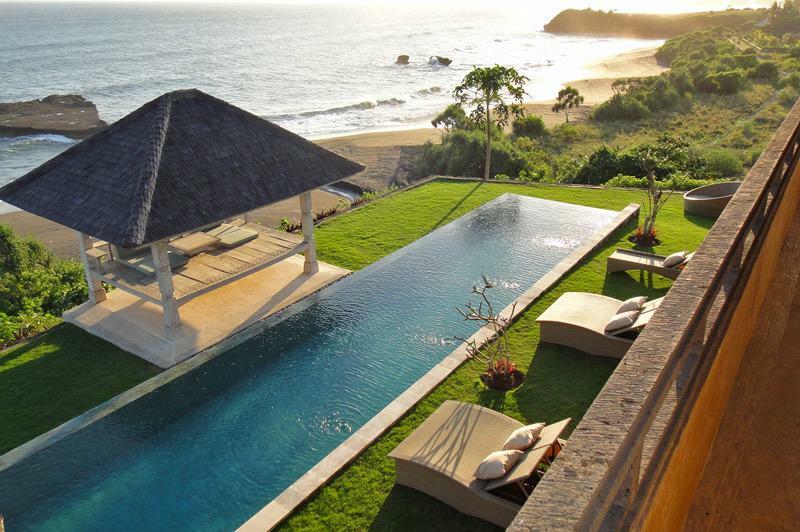 ‘Nirwana Bali Golf Course' is less than 30 minutes drive. 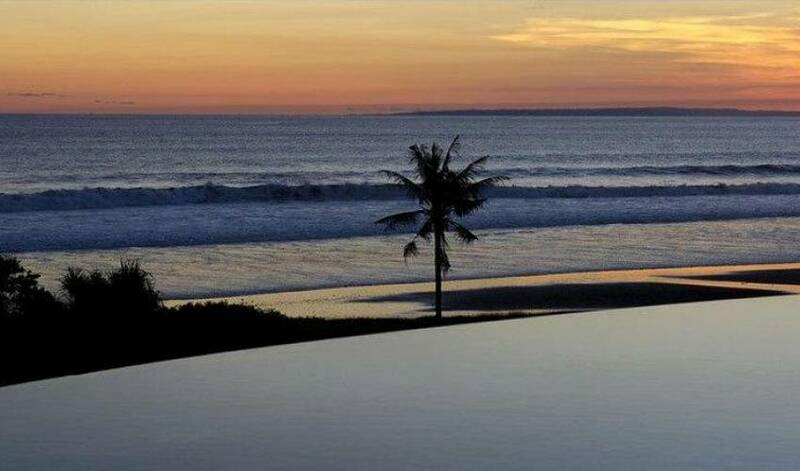 Designed by Greg Norman, this was voted the number 1 golf course in Indonesia; it is situated beside the dramatic, waved-lashed sea temple of Tanah Lot. 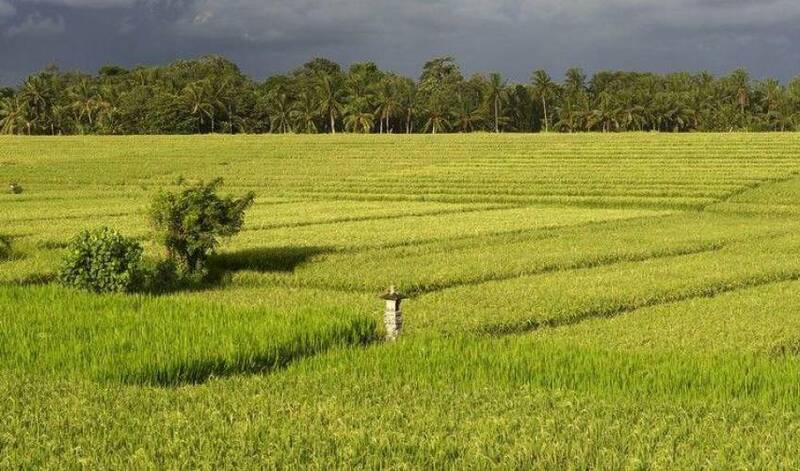 The Tabanan Regency is known as Bali's ‘rice bowl' - the most agriculturally productive area in Bali. It is also home to the 2276 metre Mt Batukaru. Local guides will lead you on anything from gentle hikes through the forests and jungle, to challenging treks up the mountain. The food forest yields coffee, cacao, palm-sugar, vanilla, candlenut, cloves and tropical fruits such as durian, jackfruit, mangosteen, salak (snakefruit), coconuts and avocados. Endemic to this area is the rare, black leaf-eating monkey; the kijang (small forest deer); beautiful butterflies and moths; flying lizards; the landak (porcupine) and the lubak (mongoose). 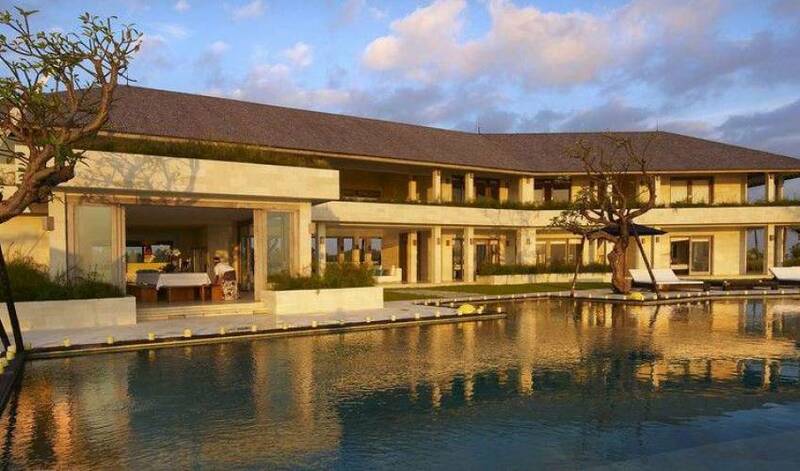 It is also a bird watchers' paradise, habitat of the Java Kingfisher and the Bali Black Eagle.